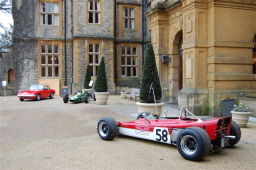 The Racing Lotus Film Festival 2009 is organised by Legends Film Festivals, the same team that organised the Legends of Le Mans and Jim Clark Film Festivals in 2009 and 2008 respectively. The event has become an annual fixture, with a different theme each year but always the same focus on an informal, friendly, relaxed atmosphere which enables enthusiasts to get close to their heroes and talk to them. - 50 years of Lotus 18 victories. With our film programme, we try to focus on rare (in some cases never seen before) footage, although there may also be some commercially available footage if we think it is sufficiently relevant to our themes. In summary, we feel that many of you will not have seen any of it, concede that some of you may have seen some of it but believe that none of you will have seen all of it! The panel usually includes a mix of drivers, designers and mechanics. Some of the panel may stand up and speak on their own, while others are happier fielding questions from the MC or the audience. At the end of the session, the members of the guest speaker panel will be available to sign autographs, books, photographs and other memorabilia. Tony Robinson, former chief mechanic, technical director and team manager of the British Racing Partnership. Gordon Huckle, Formula 1 chief mechanic in 1970 and Jim Clark's mechanic in 1967 on the Lotus 49s. Erich Walitsch, the world's leading authority on Jochen Rindt, who has recently collaborated on a documentary about Rindt which used Nina Rindt's own home movie footage and has an unrivalled collection of Rindt images. * please note that we cannot be held liable for the failure of any of our guest speakers to appear at the event. We have negotiated with them in good faith but sometimes unavoidable circumstances such as illness or a last-minute change of plans means they are unable to attend 'on the day'. The Gala Dinner is the grand finale of proceedings on Saturday and the highlight of the weekend. It consists of a delicious three-course meal followed by an after-dinner speech by one of our guest panel. This year we are delighted that Bob Dance has agreed to talk about his incredible 50 years in racing. Our guest speakers will be sharing the tables with other diners, giving enthusiasts a chance to talk to them during the evening. Diners are invited to gather in the Library for pre-dinner drinks before proceeding to their tables, providing what for many will be a once-in-a-lifetime opportunity to mingle with and engage our special guests in conversation. Dress code: black tie optional, so some people may choose to wear a dinner jacket, while others may opt for a lounge suit. Please aim to arrive at least half an hour before the start of the first film session so that you have time to register and collect your name badge. So by 10am on Saturday and 9am on Sunday. Many thanks!